The fast day of Tisha B’av, which commemorates the destruction of the First and Second Temples in Jerusalem, begins this Monday night at sundown. One of the most moving rituals of this somber holiday is the public reading of the Book of Lamentations (Eicha), whose emotionally harrowing words and plaintive tune evoke the depth of the loss. Listen to Virtual Cantor chant Eicha in the original Hebrew. Still brushing up on your biblical Hebrew? Me too. Go to Mechon Mamre for a good translation. Eicha invisions Jerusalem as a mourning widow. Other texts even envision Israel an estranged or even beaten wife. What’s with that? This is a notoriously hard holiday to explain to children. Check out this great crafts project and resist the urge to have them build a giant Lego Temple that you unceremoniously destroy. It is a said that the Temple was destroyed because of senseless hatred. Read this story about the rivalry that brought the Temple down. Once you realize how mired in this dreck we still are, consider doing something with the J to help repair this broken world. I’ve picked up a lot of new identities in this past month. Not passports or aliases, but rather identity-markers like “recent graduate” and “young Jewish professional” that are both new and strange to me. Since I moved here from the San Francisco Bay Area just over a month ago, I’ve been in the process of re-writing myself and, incidentally, re-shaping the way I see the world. Before I go further into this note, I would like to not-so-formally introduce myself. 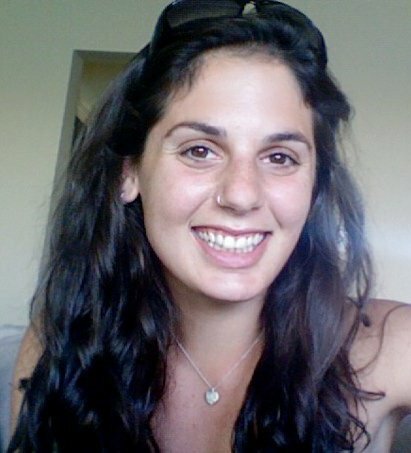 My name is Michal Rosenoer and I am the new Program Coordinator for Behrend Builders here at the Washington DC JCC. I took over this position in early September upon my acceptance into AVODAH: The Jewish Service Corps, which places a fellow in this position each year. As I mentioned earlier, I just moved to the District in late August from California where I was born, raised, and attended the University of California at Berkeley (go Bears!) As I’ve begun to make the transition from one coastline to another and from college-student to professional within the last 30 days, I can honestly say that I’m currently experiencing one of the busiest and most exciting times of my (albeit short) life. So what does it feel like to pick up all these identities at once? In college, I was just your average run-of-the-mill “liberal outdoorsy female.” Now, in a city where nametags, business cards, and even zip codes are defining features of a person, I am those things and so much more. In addition to the identifiers listed above, I have also recently become an AVODAH fellow, a housemate in an intentionally-Jewish communal home, a JCC employee, and a West Coaster (commonly identified by a lack of solid footwear in inclement weather, apparently). Coming to terms with my new life here in D.C. means not only adjusting to the pressures and expectations from each of these new titles, but also asking big questions like, “what does it mean to be doing social justice work in the city’s capital,” or “how is Shabbat a radical practice,” and of course, the ever-ongoing debate, “are these shoes work-appropriate?” Some of these discussions are entirely internal, but some have been facilitated by my peers, the AVODAH staff, and of course, my new colleagues here at the Washington DC Jewish Community Center. Right now I am struggling to answer many of these questions for myself. Sometimes I even struggle to hold them all in my head at once, but I am quickly learning that responding to these queries is an ongoing process (I think they call this personal growth); just accepting the existence of the questions and all the facets of my new life is a step in the right direction. Baby steps are key, I am told. Fortunately, I like where these baby steps are getting me thus far. While I am still adjusting to a Hekshered-kosher vegetarian kitchen and working a 40-hour work week, I think the most daunting new identity of them all – “adult” – is becoming a little less intimidating. I look forward to sharing part of my journey here, with the DC JCC community. After meeting the “Extreme Team” location staff last week, they enlisted our Behrend Builder volunteers to construct the plywood floors for the food tents (craft services for those of you in “the biz”). Sunday was the day and what a day it was! My colleague Randy Bacon (Behrend Builders’ Director) and I took a group of 18 volunteers to help out the Location Crew on the sets of ABC’s Extreme Makeover: Home Edition. It was a day to remember. We arrived at registration where we all received our hard hats and bright blue Extreme shirts. We grabbed our tools and were off to work. There was a lot of “hurry up and wait” at first since our supplies weren’t there yet, but our drills and saws were charged and we were ready to go. It only took our rockin’ group of volunteers about an hour and a half to build the first floor that was housed under the VIP food tent. And then we waited again. What’s with these TV people anyway? Don’t they do this over and over and over again? It was OK, we got more than we bargained for in a good way! In the sun and heat we waited and waited for the second round of supplies…meanwhile we watched Ty Pennington and his crew film the demolition of the Trip family house. It was pretty cool cheering the big honkin’ excavators. Double-bonus, it seemed the other volunteers for the day hadn’t made it, so when the film crew needed extras…GO Washington DCJCC! Yes, we were there to step in. Our volunteers really do whatever we need of them. At one point though I did get in a bit of a kerfuffle with the guy in charge of extras. Our supplies had finally arrived and he just didn’t understand that we needed to build a floor and didn’t have so much time to mill around (yes, those were our directions) and be on camera. In the end, we got to do both. But, I don’t think he was so happy with me. Now, there’s no telling if we’ll make air or end up on the cutting room floor, but sometime in November, you might just see a familiar Washington DCJCC volunteer or staff face on ABC. So, I had a very busy Sunday. Together we built 3 ply-wood floors, cheered on two demolitions and helped put up a tent. Four of our volunteers filmed a scene with Paulie (they’ll be acting like fish…watch for them) and we all counted down from 10, three different times so that they could get the best count-down for the demolition scene. And yes, for those that are interested…I did meet Ty Pennington and he made me a bracelet of twigs and leaves. I think he likes me. I think that Randy Bacon and Adam Levine have the best jobs at the Washington DCJCC. Don’t get me wrong, I like my job. More to the point, I couldn’t do their job. Randy is the director of Behrend Builders, our year-round shelter repair program, and Adam is our Fellow from Avodah: The Jewish Service Corps. Together they run volunteer projects for the Morris Cafritz Center for Community Service that perform needed improvements in homeless shelters, schools, low-income housing and community organizations all around the District of Columbia. The referral came from Neighborhood Legal Services. Peggy turned to them when a city inspector showed up at her house citing her for various code violations, fining her, and giving her seven days to make the repairs. Peggy, a senior who earns less than $12,000 a year, didn’t have the money. And seven days later the inspector would show up once more, and fine her again for the repairs which Peggy was unable to make. The next week, same story. The bill kept getting larger. This went on until Peggy had accrued $9500 in fines. More than 75% of what her total income for the year is. Once NLS connected Peggy with Behrend Builders, Randy and Adam got to work. After about a month, this is the report. They got a new inspector assigned to Peggy’s case and with a letter of intent to complete all repairs within 120 days, were able to stop the weekly fines from mounting up. They’ve already brought in several teams of volunteers and performed about $1500 worth of construction on her home, including replacing the stairs (pictured below), removing a crumbling retaining wall and hauling it away. Randy estimates that her property probably needs another $8,000 of repair work including sheet-rock and flooring. At some point, her roof will need to be dealt with as well. And every week, Randy and Adam bring another group of volunteers out to Southeast and get a little more done. It is literally Tikkun Olam. One step at a time. 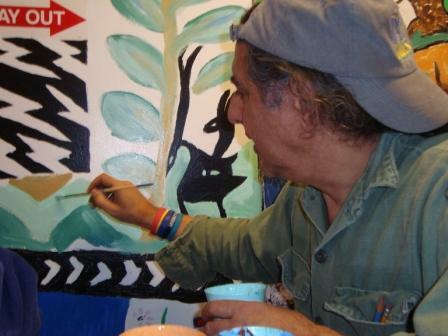 To learn how you can volunteer, click here to sign up for the Volunteer View, our eNewsletter. 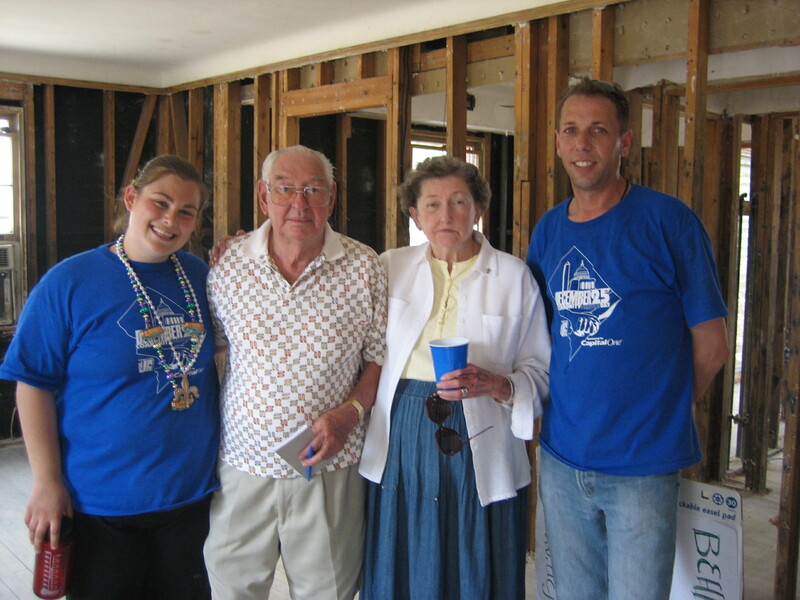 One of the families helped by Behrend Builders in New Orleans with (former) Behrend Coordinator Annie Mehlman and Director Randy Bacon. It has been three years since Hurricane Katrina made landfall in New Orleans, so we sent the following questions to Randy Bacon, a New Orleans native and director of the Behrend Builders Shelter Repair program at the Washington DCJCC. Randy led a group of volunteers to New Orleans in May/June of 2006. Where were you when Katrina hit? How did your family in New Orleans do both before and after the levees broke. When Katrina hit New Orleans I was here in DC and watching the television non-stop to see what was going on. My family waited until about 12 hours before the storm actually hit New Orleans before leaving. They took 11 different cars filled with parents, grandparents, brothers, sisters, spouses, nieces and nephews. At some point I lost contact with every family member and once the storm made landfall they lost all cell phone reception. It wasn’t until 6 days later that I was finally able to talk to one of my brothers. He explained that everyone in my family was okay but scattered around at different hotels in different states. He explained that they were running into problems accessing money from ATMs and wouldn’t be able to purchase food or pay for the hotels once all the cash on hand was gone. What was it like the first time you went back to New Orleans after Katrina? The first time I went back to New Orleans was when Behrend Builders orchestrated a volunteer project on which we took a total of 14 people from the DC area to go do some relief work in the hardest hit areas of New Orleans. We intended on gutting 2 houses for families that had 8 to 12 feet of water inside the homes, but our volunteers pushed themselves and we did a total of 4 houses. Each gutting job probably saved the families around $10,000 dollars per home. We began by removing all personal items and then started at the ceiling and didn’t stop until we could see the concrete on the floor and in some cases the grass underneath the raised homes. I have been back since and all of the houses we gutted have been repaired and are once again a HOME. How did the Behrend Builder’s trip to New Orleans come-about? The Behrend Builder trip came about when the previous Coordinator (Annie Mehlman) approached me to see how she could help me or my family. I said we would be fine and she suggested we plan a relief trip to help those in need. What do you think will happen if Gustav lands on the city? Is your family staying? My family hasn’t made a decision on what they will do this time. They will decide early tomorrow morning. UPDATE: Randy emailed me this evening to say that his parents have decided to leave New Orleans and ride out the storm from a safer distance. Our thoughts and prayers go out to his parents and everyone along the Gulf Coast.